Dr. Janet Galván, Director of Choral Activities at Ithaca College, conducts the Ithaca College Choir and Women's Chorale. Her New York colleagues recognized Dr. Galván’s contribution to choral music in 1995 when she received the American Choral Directors Association (ACDA) New York Outstanding Choral Director Award. Dr. Galván was awarded the Ithaca College Faculty Excellence Award for teaching, scholarship, and service in the spring of 2018. Sought after as a guest conductor of choral and orchestral ensembles, she has conducted professional and university orchestras including Virtuosi Pragenses, the Madrid Chamber Orchestra, and the Cayuga Chamber Orchestra, in choral/orchestral performances. 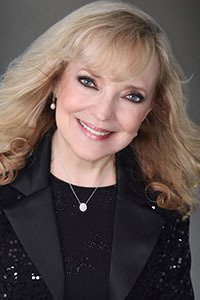 She has conducted national, divisional, and state choruses throughout the United States for the American Choral Directors Association (ACDA), National Association for Music Educators (NAfME), Organization of American Kodàly Educators (OAKE), and has conducted ensembles of all ages, from adult professional choirs to children’s choirs. She has conducted choruses and orchestras in venues such as Carnegie Hall, Boston’s Symphony Hall, Washington’s Constitution Hall, Minneapolis’ Symphony Hall, Pittsburgh’s Heinz Hall, and Nashville’s Schermerhorn Symphony Center. She has conducted her own choral ensembles in Carnegie Hall, Lincoln Center’s Alice Tully Hall, and Avery Fisher Hall as well as in concert halls in Ireland, Italy, the Czech Republic, Austria, Canada, and Spain. Her own choral ensembles have performed in Carnegie Hall, Lincoln Center’s Alice Tully Hall as well as in concert halls throughout Europe and Ireland. Galván was the sixth national honor choir conductor for ACDA, and was the conductor of the North American Children’s Choir which performed annually in Carnegie Hall. She was also a guest conductor for the Mormon Tabernacle Choir. Galván has been a guest conductor and clinician in in the United Kingdom, Ireland, throughout Europe, Canada and in Brazil as well as at national music conferences and the World Symposium on Choral Music. She was on the faculty for the Carnegie Hall Choral Institute, the Transient Glory Symposium and the Oberlin Conducting Institute. Galván was a member of the Grammy Award-winning Robert Shaw Festival Singers. Galván has two choral music series with the Roger Dean Publishing Company and was the series advisor to Latin Accents, a series with Boosey & Hawkes. Her articles about choral music have been published internationally. Galván has been recognized as one of the country’s leading conducting teachers, and her students have received first place awards and have been finalists in both the graduate and undergraduate divisions of the American Choral Directors biennial National Choral Conducting Competition. Her students can be found conducting professional ensembles, teaching at the university level, teaching in public schools, conducting children's choruses, and conducting on Broadway. In addition, she has been an artist in residence at many universities, leading masterclasses, working with the university choirs, and presenting sessions. Dr. Galván was a member of the Grammy Award-winning Robert Shaw Festival Singers (Telarc Recordings). Janet Galvan conducts New York State Mixed High School Chorus.